Police in Dubai may soon have access to functional hoverbikes, according to AutoBlog, which reported that Dubai Police had unveiled the new technology in conjunction with Russian company Hoversurf at the Gulf Information Technology Exposition last week. Per Autoblog, the Scorpion hoverbike is capable of flying approximately 16 feet (five meters) in the air, moving at a speed of 43 miles per hour (70 kilometers per hour) and carrying 660 pounds (300 kilograms) of gear. It’s thus capable of clearing traffic-packed roads, but one serious drawback is the unit’s limited, 25 minute charge capacity. The Scorpion’s rotor blades also look ready to chop through anything it might bump into, like humans, and sort of looks like it is as dangerous for the operator to fly as for anyone who might wander into its path. The police force intends to use the hoverbikes as tools for officers to bypass traffic and other obstacles during emergencies, though the United Arab Emirates has a notoriously poor human rights record, so authorities there may put them to somewhat less agreeable purposes. The US military, as well as various specialty shops and hobbyists, have had varying degrees of success working on their own hoverbikes. 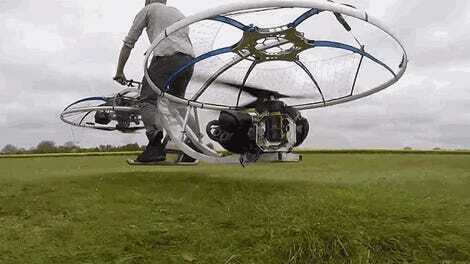 Most of them look alarmingly unsafe, but hey—as the saying goes, you can’t make a hoverbike without amputating a few limbs. CNN reported that the hoverbikes were announced alongside a new electric motorcycle concept by Japanese company Mikasa, which was touted as having a 124 mph (200 km/h) top speed. According to ABC, Dubai authorities are also planning on rolling out small, driverless vehicles for surveillance in urban areas.